The Fostex speakers are used for full sound reproduction, and it looks like there’s a few other pieces of hardware mixed in there alongside a couple of NHL hockey pucks and a nifty Death Star coaster. Great setup! Keep your great Apple & Mac setup shots coming! Send us your own workstation pictures to osxdailycom@gmail.com, include a good picture or two, a brief list of the hardware – both Apple and otherwise, and don’t forget to mention what you use the gear for. All are welcome! What kind of camera do you use? What software is used by pros for video and image correction, is Adobe king of the hill? And how on earth are you connecting an xBox 360 to a Mac?? 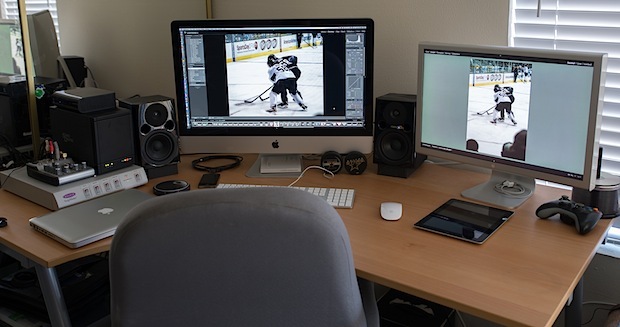 Great Mac desk, I love the iMac and I want to get one myself one of these days! I have just got the latest iMac – love it and completely recommend it. I was like WOW! when I first saw you could connect a PS3/xBox 360 Controller to a Mac. Then I got Mafia II and paired my PS3 controller over Bluetooth – there are loads of video tutorials on YouTube – go check it out :D Works great and is far better than using the keyboard and mouse – trust me. I use adobe lightroom and photoshop for photos and final cut studio 5 for editing and adobe encore for dvd authoring. I am also shooting a nikon d600 with battery grip and the photo you see on screen was grabbed by a nikon 70-200 f2.8. Since you have both an iMac with glossy display and a (somewhat) old matte Cinema Display, I’m curious as to your thoughts on the differences between those two displays? The glossy display is nice when looking at some thing high contrast and i enjoy the over color render better on it. But at 27inches sometimes you get a bit of glare and that drives me nuts. I switch between displays quite a bit i have also found that any sort of gaming done on the 27 inch screen to be troublesome due to the larger than normal resolution. The older 23 inch runs at 1920 x 1200 and more games seem to be ok with that resolution. Also did this get taken off the site ? It seems to not show up under the Mac Setups section.